Hi y’all and thank you Sarah for letting me take up some space for my new release. 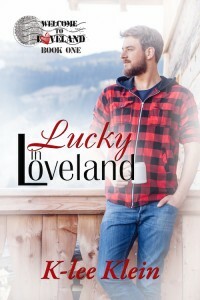 Lucky in Loveland comes out on February 13. It’s my first self-published book and also the first in a new series, Welcome to Loveland. Loveland is a real city in Colorado and it is known for having a special connection to Valentine’s Day. Every year volunteers in Loveland help make over 130,00 Valentine dreams come true. Their re-mailing program allows people to send messages of love to with a special Loveland stamp to make the day even more special. When I heard about the program, I knew I wanted to do a story that included it, or something like it anyhow. But just the name of the city—Loveland—made me think romance and love, and what better time of year to write a story about both those things than on Valentine’s Day. Lucky Roberts, of Lucky in Loveland, was born and raised in Loveland. He’s a rough and tumble guy’s guy, or so you’d think when first encountering him. He meets Jack and his true colours come through. He’s a romantic or at least he wants to be. And Jack, who could really use a little romance in his life…well, he eats it up with a spoon. I wanted to write a love story set in the perfectly named city of Loveland and I hope that’s exactly what I did. To thank you for stopping by I’m giving away an ebook copy of Lucky in Loveland to one commenter. Simply leave your name, email address, and a comment about you’re your fave think in a romance story is. I’ll select a winner from the comments here–contest is open until Friday, Feb 19th. Thanks again and happy Valentine’s Day. …Lucky filed that bit of information away. It was practically sacrilege to live in Colorado without knowing how to skate, and the festival was mandatory for anyone in Loveland. Even if you got off the bus yesterday, you’d have already heard about the festival. Or so Lucky thought. He was quite proud of his little presentation, even though it only lasted another ragged ten minutes or so. The kids had obviously had enough sitting still and being on their best behavior. Lucky totally understood that. He’d been one of those squirming, hyperactive kids growing-up, and the part he’d been looking forward to most was up next. With a conspiratorial glance at Jack, Lucky retrieved the bags he’d left by the desk. He had to choke-off his own childish squeal as he handed-out the miniature foam hockey sticks and pucks, much to the enthusiastic delight of the kids. He wasn’t sure Mr. Jack was entirely struck on the idea, but by the time he considered checking with him, Lucky was already sprawled on the floor with his oversized hands stuffed into foam goalie gloves. This is my show ‘n tell. His legs spread wide as pucks were shot, kicked, and even thrown at him, Lucky let them rack up their goals, confident the pucks were soft enough to do him no damage. He protected his package with great skill. By the time Jack called a time-out, Lucky was breathless from laughing and the kids were worked into a total frenzy. He hoped he hadn’t caused Jack too much trouble. He even tried to feel sorry for Jack—he really did—but he was too happy to care, Maybe, just maybe, he could make it up to him later. Did kindergarten kids still have naptime? Lucky thought he could use one too. Lucky watched transfixed as Jack settled the kids into a coloring exercise with barely any fuss or attitude. He remembered coloring had always been one of his favorite parts of school. That, and recess, of course. Jack obviously had impressive rugrat managaement skills. Lucky blushed. “Is that a yes, then?” he asked while his heart hammered in his ears. The amused expression on Jack’s face would have been pure comedy if Lucky hadn’t suddenly felt so mortified at his own words. He bit his bottom lip until a metallic taste flooded his mouth, a flush settling in for the winter from his neck to the tips of his ears while Jack snickered into his hand. “I’m not touching that with a ten-foot pole. Six o’clock. I’ll be there. Say goodbye to the little monsters for me.” He’d swaggered his way about two doors down the hall when he called out to Jack again. “Oh, hey! Among her favourite sub-genres to read and write are rock stars, cowboys, shifters, friends-to-lovers, and opposites-attract relationships. But to be honest, she’s open to almost anything if it involves messing around in the heads of her characters. She’s also big on series—because she has a hard time letting her characters go—and is usually working on a handful of stories in various stages of completion all at the same time. This entry was posted in Uncategorized and tagged announcements, contests, gay romance, giveaway, GLBTQ, guest blog, male male romance, promo, Sarah Madison, writing by Sarah Madison. Bookmark the permalink. Thank you for having me, Sarah. It means a lot.